This year I ended up deciding to go to South East Asia for three months. 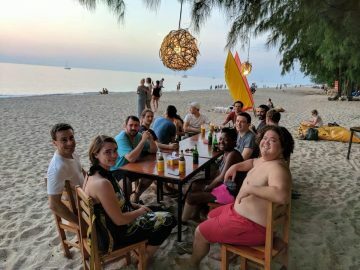 As recommended by friends, one of the destinations was KoHub, a co-working space in Ko Lanta, Thailand. This ended up being a great decision. I was able to get away from the cold Swiss winter and meet great people from all around the world. 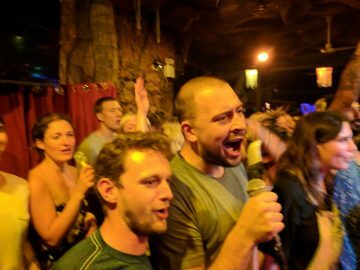 I stayed in Thailand for just over three weeks. I got an accommodation right next to the co-working space which made the daily commute a two minute walk. Ko Lanta is a small island in the south of Thailand on the west coast. It is a bit more expensive than the rest of Thailand, but for sure still cheaper than Switzerland. The co-working space had four main places to work. The Hub, the air conditioned main room with a bit of foot traffic as it connects to most of the facilities and other rooms. The Study, is the air conditioned quiet room. Desk 1 and 2, were covered areas allowing me to work outside in the fresh air. The Annex, which is the third large room again with airconditioning with it’s own toilets. For my team and client meetings I was able to reserve a small skype booths so not to disturb others. One of the differences that I noticed at this co-working space was, that all of the members were from abroad. Some had come a few weeks to escape the cold weather in Europe, where others stopped on their journey. During my time two companies came to spend a month working and living together. A number of people were surprised to hear that I was employed and was able to work remotely at the same time. 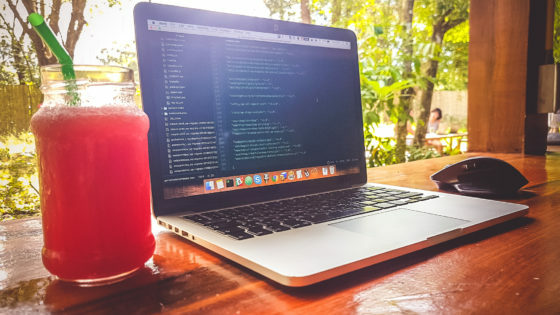 One of the cool features that I really loved was being able to order food and drinks straight to your workspace. You just had to load money on your account, choose something from your menu and select in which area you were working and the staff would prepare it and bring it to you. 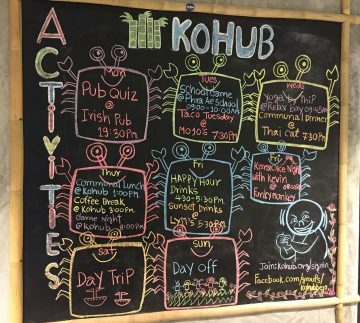 To allow members to get to know each other better and have a bit of fun KoHub organises a number of events over the week. 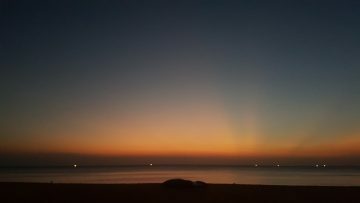 The two weekly activities that I enjoyed the most of were the Friday night Karaoke and watching the sunset on the beach. On my first weekend there we went snorkeling as a group which was good fun. A fellow “KoHubber” organised a Kayaking day trip on another weekend which was really enjoyable after a hard week of work. This was the first time I had ever joined a co-working community and this experience has made want to find other places where I can meet other digital workers. I would love to come back next year to meet some of the friends I have made who come every year.